We here in the apartment have been sucking down bottles of my quick Berliner weisse in the summer heat, but only now have I been able to get a good picture of a pour and write up a review. Besides serving it quite a few of my friends, I was also able to bring a bomber of the brew to the last NYC Homebrewers Guild meeting. Some said that the beer was mouth-puckeringly sour while others suggested I make it more sour still. Many of those who were just returning from the National Homebrewer Conference in Philadelphia a few weeks before agreed that my beer was much more pleasant than many unfortunate examples of the style that had been served at the conference. One person even said it was her favorite beer that had been shared that night. Appearance: Very pale, almost as pale as white wine. 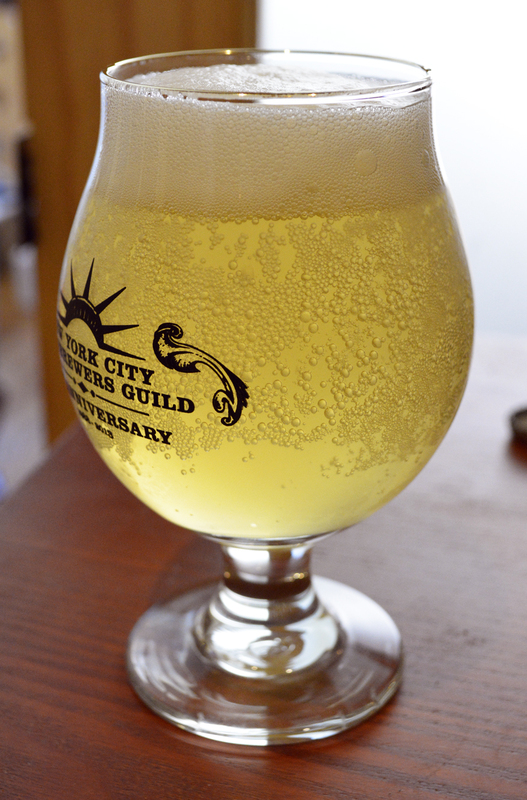 Hazy with very active carbonation, constant bubbling. It’s easy to get a fluffy head on the beer, but it dissipates quickly, going from over an inch to nil in under half a minute. Aroma: Doughy, faint lemon and cut grass. There is significant variation across bottles, some smelling more strongly of dough. At the homebrew meeting some people noted a musty or sulfury aroma, which I also noticed in previous bottles, but the two I drank for this review were quite clean. Flavor: Strong acidity, with both lactic acid and carbonation biting at the tongue. The only way I can think to describe it is bright. There’s no harshness like what I experience drinking seltzer water, but it’s not much deeper in flavor either. I had two bottles, one which I let warm a bit, and the second bottle had a bit more of a lemon note, but it was still quite subtle. Mouthfeel: Very light, very fizzy. Very much soda-like. It leaves the mouth feeling clean and clear, though there is a slight residual sweet and tart taste to my lips left behind. Overall: Super refreshing, and exciting that it came out without any glaring flaws for my first sour, but I think the carbonation simply overpowers the sourness. As it warms more sourness comes through, and the flavor picks up just a bit of complexity. I received a lot of compliments on this at the homebrew meeting, but I’m eager to experiment further. I don’t have any other beers in this style to compare it to, so I don’t really know if I’m expecting more from the style than I should be or if my brew is somewhat deficient. In future renditions I’ll probably try to get more intense sourness, perhaps try adding some Brett, or even simply play with the OG to see what a stronger alcohol presence might do. This entry was posted in beer, learning, tasting and tagged homebrew club, lactobacillus, NYCHG, review, sour beer, weisse on July 27, 2013 by Dylan Bargteil.